Sweet Home Ranger District (US Highway 20) from the South Santiam River to the Deschutes River. In other words, the Willamette National Forest is filled with special places! We've used this page to feature places and areas that offer a special type of experience but there are many more. Visit our recreation page to discover your very own special place on the forest! You can also use the interactive visitor map to select the National Forest of interest in addition to the Interactive Boat Oregon Map to select the Oregon boating area of interest. Burn all wood and coals to ash, put out campfires completely and then scatter cool ashes. Foster Dam Fish Counts for ODFW. Big Lake is 225 acres in size and is situated on the historic Santiam Wagon Road. It was the first resting place for early travelers heading west. A 49-unit Big Lake campground on the western shore has been established by the Willamette National Forest, and a Seventh Day Adventist youth camp operates under special use permit on the east side of the lake. The NF campground is located adjacent to the Santiam Pass Motorized Recreation Area (area is unavailable) and is a popular campground for OHV enthusiasts. Volcanic peaks and cinder cones visible from the lake include Mt. Washington, Sand Mountain, Hoodoo Butte, Hayrick Butte and Three Fingered Jack. Big Lake is popular for motor boating and water skiing, as well as camping, picnicking, fishing and swimming. Access to wilderness trailheads is located nearby. The nearby Santiam Pass Dispersed Motorized Recreation Area is open to Off-Highway Vehicles. A boat launch is located in the Big Lake Day Use Area (fee required). The lake used to be an excellent producer of brook trout, but they now run second to kokanee; cutthroat trout are also present. Two campgrounds are situated on the lake. Directions from Santiam Junction travel 5.0 miles to Big Lake off of the Santiam Hwy and is operated by the U.S. Forest Service at 541- 475-9272. Turn right onto Big Lake Rd and continue traveling on Big Lake Rd. until it becomes the Old Santiam Wagon Rd. NF-2690-810 for the approximately 3.1 miles to the campground. Big Lake Area: Big Lake Day Use Area (fee required) is located in the Big Lake Campground. Nearby Patjens Lakes Trail #3395 offers easy access to the Mt. Washington. the Patjens Lakes Trail is located in the high elevation ecosystem, Patjens Lake trail passes through a mixed forest of lodge pole pine, western hemlock, and alpine fir. Some of the forested are burned over from fires. Three small lakes are accessed from the trail. Entry into the wilderness area require a self issued permit available at the trail head. Metolius River Deschutes National Forest the Sisters Ranger District The crystal clear Metolius is a spring-fed Wild and Scenic River which passes through stately ponderosa pine forests near Camp Sherman on the Sisters Ranger District. Public trails along the river can be easily accessed from many areas, including public campgrounds and from the Camp Sherman Store area. Driving or biking though the area along Road 14 is also popular and provides many scenic views of riparian and forest wildflowers. Directions to the Metolius River. Depart US-20 / Or-126 / Santiam Hwy toward McAllister Rd / George McAllister Rd. Turn left onto SW Camp Sherman Rd. Turn left onto SW Camp Sherman Rd. For 2.6 miles. Bear right onto SW Metolius River Rd. for 0.5.Bear right onto SW Metolius River Rd. Arrive at Arrive at SW Metolius River Rd. SW Metolius River Rd, Camp Sherman, OR 97730. The Metolius River (From Wikipedia) is a tributary of the Deschutes River in Central Oregon, United States, near the city of Sisters. The river flows north from springs near Black Butte, then turns sharply east, descending through a series of gorges before ending in the western end of the lake. The unincorporated community of Camp Sherman lies astride the southern end of the river. The name of the river comes from the Warm Springs or Sahaptin word mitula, meaning white salmon and referring to a light colored Chinook salmon and not a whitefish. Metolius Springs - Wikipedia Overview Metolius Springs are located just north of Black Butte near the small unincorporated town of Camp Sherman in central Oregon, United States. The springs are the source of the Metolius River, which flows 29 miles (47 km) through the Deschutes National Forest emptying into Lake Billy Chinook. The flow from Metolius Springs is sufficient to create a full-flowing river, making the Metolius River one of the largest spring-fed rivers in the United States. Allen Springs from Sisters, OR, take US Rt. 20 west 8.4 miles to Metolius River/Camp Sherman sign. Turn right at sign onto Forest Rt. 14 and go 1.6 miles to a "Y" intersection. Bear right, staying on Forest Rt. 14, and go 8 miles to campground on left. The campground has a two-site spur set away from the Metolius River and a loop along the river's edge. The spur is tucked into a wooded area while the loop hugs the river's bank were Ponderosa pine and cedar provide some shade. Widely spaced sites have good to outstanding privacy. The gentle sound of the river can be heard at all sites. Allingham from Sisters, OR, take US Rt. 20 west 8.4 miles to Metolius River/Camp Sherman sign. Turn right at sign onto Forest Rt.14 and go 1.6 miles to a "Y" intersection. Bear right, staying on Forest Rt. 14, and go 3.2 miles to Camp Sherman/Campgrounds sign. Turn left at sign onto Forest Rt. 1419 and go 0.1 miles to a "T" intersection. Turn right onto Forest Rt.1419-900 and go 0.6 miles to campground on left. The campground is a spur ending in a small loop in a stand of young Ponderosa pine within a short walk of the Metolius River. A compact campground, sites are close together and have little privacy. Firewood is available for a fee. Gas, limited groceries, fly-fishing supplies, and snacks are available at the nearby Camp Sherman Store. Blue Bay from Sisters, OR, take US Rt. 20 west 11.9 miles to Suttle Lake Resort-Marina (and campground) signs. Turn left at sign onto Forest Rt. 2070 and go 0.8 miles to campground on right. The campground has two unnamed loops meandering up and over hills on the southeast end of Suttle Lake. Douglas fir provides lots of shade and good separation between sites and young deciduous trees, such as maple, result in good privacy. Some sites are on the water's edge and most have a view of the lake. Firewood and ice are available for a fee. Camp Sherman from Sisters, OR, take US Rt. 20 west 8.4 miles to Metolius River/Camp Sherman sign. Turn right at sign onto Forest Rt.14 and go 1.6 miles to a "Y" intersection. Bear right, staying on Rt. 14, and go 3.2 miles to Camp Sherman/Campgrounds sign. Turn left at sign onto Forest Rt. 1419 and go 0.1 miles to a "T" intersection. Turn right onto Forest Rt.1419-900 and go 0.1 mile to campground on left. The elevation is 2,900ft. The campground stretches along the Metolius River through a stand of mixed trees including Douglas fir, Lodgepole, and alder. The campsites south of the entrance are sunnier, more open, and less private. The north end sites are very shady and have a secluded, private feel. Within walking distance of campground is the Camp Sherman Store where limited groceries, gas, fly-fishing supplies, and goodies like a morning coffee or afternoon ice cream snacks, are available. Firewood is available for a fee. Candle Creek from Sisters, OR, take US Rt. 20 west 8.4 miles to Metolius River/Camp Sherman sign. Turn right at sign onto Forest Rt. 14 and go 1.6 miles to a "Y" intersection. Bear right, staying on Forest Rt. 14, and go 10.8 miles to an intersection. Turn right and go 0.4 miles to campground sign. Turn right onto Forest Rt. 980 and go 1.5 miles to campground. NOTE: Forest Rt. 14 becomes Forest Rt. 12 at Lower Bridge campground and changes to gravel for the last 2.3 miles. The elevation is 2,700ft. This dusty campground stretches along a bluff where Candle Creek meets Metolius River in a stand of Douglas fir. Most sites overlook either the raging Metolius River or the babbling Candle Creek. Although it can accommodate RV campers, the campground is best suited for slide-ins, car and tent campers. The campground has a wilderness feel. The river is very loud in the background. Cold Springs in Sisters, OR, at the intersection of US Rt. 20 and State Rt. 242, take State Rt. 242 west 3.9 miles to campground on right. The elevation is 3,500 ft. The campground is a single loop that meanders through shimmering Aspen and stately Ponderosa pine. The campground has an understory of grass and pine needles. A very pretty campground with good to excellent privacy, is close enough to the Santiam- McKenzie Scenic Byway and Sisters, OR, to explore both without breaking camp. The campground is good for an overnight stop but too lovely for just a one-night stay. Several little bridges across streams crisscrossing the campground, give it an additional scenic element. An unmarked trail at the campground's entrance leads to an active spring. Driftwood in Sisters, OR, at the intersection of US Rt. 20 (W Cascade Ave) and S Elm St, take S Elm St south 15.6 miles to campground sign. Turn right and go 0.1 miles to campground. NOTE: S Elm St becomes Forest Rt. 16. For the last 1.7 miles, Forest Rt. 16 is rough, dirt and rocky. The elevation is 6,500 ft. The campground hugs the north shoreline of the glacier-carved Three Creek Lake. Every site is on the lake and has a view of the Tam McArthur Rim. Fir and hemlock provide ample shade to sites. Widely spaced, the campsites enjoy good privacy. Three Creek Lake is popular with wildlife, campers, and canoeists. Located below Tam McArthur Rim and next to the Three Sisters Wilderness, the campground has a wilderness feel and offers a good base camp location for exploring the area. Limited groceries, snacks, ice and boat rentals are available at the nearby Three Creeks Lake Store. Firewood is available for a fee at campground. Gorge from Sisters, OR, take US Rt. 20 west 8.4 miles to Metolius River/Camp Sherman sign. Turn right at sign, onto Forest Rt.14, and go 1.6 miles to a "Y" intersection. Bear right, staying on Forest Rt. 14, and go 3.2 miles to Camp Sherman/Campgrounds sign. Turn left at sign onto Forest Rt. 1419 and go 0.1 miles to a "T" intersection. Turn right onto Forest Rt.1419-900 and go 1.5 miles to campground on left. The elevation is 2,900ft. The campground is a single loop along the Metolius River in a stand of Ponderosa pine. Sites adjacent to the river have the most shade, good views of the river, and are occupied first. Firewood is available for a fee. Gas, limited groceries, fly-fishing supplies, snacks, and coffee are available at the nearby Camp Sherman Store. Graham Corral in Sisters, OR, at intersection of US Rt. 20 and State Rt. 242, take Rt. 242 west and go 3.8 miles to Graham Corral sign. Turn right at sign, onto Forest Rt. 1012, and go 1.9 miles to another Graham Corral sign. Turn left at sign and go 1.8 miles to campground on left. The elevation is 3,400 ft. This horse camp is huge, well suited to groups and individual equestrian campers. The campground loops around four large corrals with campsites tucked back among large Ponderosa pine. Several of the sites have their own corral or hitching rails. Privacy is good. The campground is near some private Black Butte Ranch homes. Indian Ford from Sisters, Or, take US Rt. 20 west 4.5 miles to campground sign. Turn right at sign and immediately right again into campground. Elevation is 3,300 ft. The campground has two unnamed loops in a stand of Ponderosa pines next to US Rt. 20. Traffic noise can be distracting. Sagebrush offers fair privacy. The campground is close enough to Sisters to be a base camp for enjoying the town's many activities. It is also a convenient overnight campground for transient campers. Jack Creek from Sisters, OR, take US Rt. 20/State Rt. 126 north 11 miles to Forest Rt. 12 (Jack Lake Rd.). Turn after sign onto Jack Lake Rd. and go 4.3 miles to an intersection and Jack CR sign. Turn left onto Forest Rt. 1230 and go 1.1 miles to Head of Jack Creek sign. Turn left at sign onto Forest Rt. 1231 (dirt) and go 0.1 miles to campground on left. The elevation is 3,200 ft. The campground is a large loop reaching upstream on Jack Creek in a stand of mostly Ponderosa pine and some fir trees. The campsites are huge, most of which can accommodate multiple RVs. The sounds of Jack Creek are heard throughout campground. Because of no under or middlestory, privacy between campsites varies from poor too good. Link Creek from Sisters, OR, take US Rt. 20 west 11.9 miles to Suttle Lake Resort-Marina and campground signs. Turn left at sign onto Forest Rt. 2070 and go 2.1 miles to campground on right. Elevation is 3,500 ft. The campground has two unnamed loops at the west end of Suttle Lake in a stand of Ponderosa pine and Douglas fir. Most sites have a view of the lake and ample shade. With minimal middlestory and almost no understory, privacy is poor. Some traffic noise from US Rt. 20 can be heard in campground. Firewood is available for a fee. Ice, pizza, and snacks are available across the street at Camp Davidson. Lower Bridge from Sisters, OR, take US Rt. 20 west 8.4 miles to Metolius River/Camp Sherman sign. Turn right onto Forest Rt. 14 and go 10.2 miles to campground on right. The elevation is 2,800 ft. The campground is a single loop through a stand of Ponderosa pine next to the Lower Bridge and beside the Metolius River. Although the campground can accommodate RV campers, it is better suited for slide-in, car, and tent campers. The campsites are nicely shaded, but with no under or middlestory, privacy is poor. Pioneer Ford from Sisters, OR, take US Rt. 20 west 8.4 miles to Metolius River/Camp Sherman sign. Turn right at sign onto Forest Rt. 14 and go 1.6 miles to a "Y" intersection. Bear right, staying on Forest Rt. 14, and go 9.6 miles to campground on left. The elevation is 2,800ft. The campground is a large single loop beside the Metolius River. Most of the sites are on the river side of loop, tucked in under Ponderosa pine, Douglas fir, and a few cedar. An understory of grass, shrubs and pine needles keep dust down. Widely spaced sites have good to outstanding privacy. The gentle sound of the river can be heard at all sites. An open-air Civilian Conservation Corps (CCC) era kitchen is located at the tent only sites and has been nicely restored. Firewood is available for a fee. Riverside from Sisters, OR, take US Rt. 20 north 8.4 miles to Metolius River/Camp Sherman sign. Turn right at sign onto Forest Rt. 14 and go 1.6 miles to a "Y" intersection. Bear right, staying on Forest Rt. 14, and go 1.6 miles to campground on left. The elevation is 3,000 ft. This walk-in tent only campground stretches 0.3 miles through an open stand of Ponderosa pine near some summer homes and the Metolius River. This is an excellent campground for large groups. Contrary to the campground name, the Metolius River cannot be seen or heard from the campsites. Widely spaced sites have good privacy. Sheep Springs from Sisters, OR, take US Rt. 20 west 11 miles to Forest Rt. 12 sign. Turn right after sign onto Jack Lake Rd./Forest Rt. 12 and go 4.3 miles to Jack Cr sign. Turn left at sign onto Forest Rt. 1230 and go 1.6 miles to a "Y" intersection and "Sheep Creek Sprs Horse Camp" sign. Bear right, staying on Rt. 1230 (gravel) and go 1.5 miles to another Horse Camp sign. Turn right at sign onto Forest Rt. 1260 and go 1.9 miles to still another Horse Camp sign. Turn left and go 1.3 miles to campground on right. NOTE: Last 3.2 miles are dirt, single lane with turnouts. The elevation is 3,200 ft. This equestrian campground is a small, dusty and crowded loop in a stand of mixed conifers including Douglas and other fir. Each campsite has a sturdy pole stall for at least a couple horses. From the lack of ground cover and other indications, this is a popular horse camp with no privacy between campsites. Sheep Springs, located outside of campground, provides ample water for stock. Smiling River from Sisters, OR, take US Rt. 20 west 8.4 miles to Metolius River/Camp Sherman sign. Turn right at sign onto Forest Rt. 14 and go 1.6 miles to a "Y" intersection. Bear right, staying on Forest Rt. 14, and go 8 miles to campground on left. The elevation is 2,700 ft. The campground has a two-site spur set away from the Metolius River and a loop along the river's edge. The spur is tucked into a wooded area while the loop hugs the river's bank were Ponderosa pine and cedar provide some shade. Widely spaced sites have good to outstanding privacy. The gentle sound of the river can be heard at all sites. South Shore from Sisters, OR, take US Rt. 20 west 11.9 miles to Suttle Lake Resort-Marina and campground signs. Turn left at sign onto Forest Rt. 2070 and go 0.9 miles to campground sign. Turn right and go 0.1 miles to campground. The elevation is 3,500 ft. The campground has two long spurs in the middle of Suttle Lake's south shore. Sites are shaded by a mix of Douglas fir and Ponderosa pine. One spur stretches along the Lake's bank while the second spur stretches across the hillside above. Most sites have a view of Suttle Lake and some can watch traffic on US Rt. 20. A steady breeze off the lake and ample shade keeps the campground comfortable. A limited middlestory provides some privacy. Firewood and ice are available for a fee. Three Creek Lake in Sisters, OR, at intersection of US Rt. 20 (W. Cascade Ave) and S. Elm St, take S. Elm St south 16 miles to campground. NOTE: S Elm St becomes Forest Rt. 16. The last 2.1 miles of Forest Rt 16 are rough, dirt, and rocky. The elevation is 6,500 ft. The campground, on the glacier-carved Three Creek Lake, wraps around the Lake's south shore. Sites are tucked into a stand of mixed conifers including Lodgepole pine, hemlock, and Subalpine fir. The Lake is popular with wildlife, such as bald eagles, osprey, mink, deer, tent campers, and canoeists. Although the campground could accommodate small RVs, the access road is best suited for car, tent, pop-up tent trailers, and slide-in campers. Located below Tam McArthur Rim and next to the Three Sisters Wilderness, this tranquil campground has a wilderness feel and offers a good base camp location for exploring the area. Limited groceries, snacks, ice and boat rentals are available at nearby Three Creeks Lake Store. Firewood is available for a fee at campground. Three Creek Meadow in Sisters, OR, at intersection of US Rt. 20 (W. Cascade Ave) and S. Elm St, take S. Elm St south 14.5 miles to campground. NOTE: S Elm St becomes Forest Rt. 16. The last 0.6 miles of Rt. 16 are rough, dirt, and rocky. The elevation is 6,300 ft. The campground has two sections. The first section is for people-only campers while the second section, with stock water tanks and sturdy pole stalls, is for equestrian campers. The horse section is compact with sites close enough to promote bonding and has a fair amount of shade. The non-equestrian section has open, sunny sites and all of the campground's pull- through sites. This section is next to a large grassy meadow and has great views of the Tam McArthur Rim. Close to the Three Sisters Wilderness, the campground is a good base camp for exploring the area. Nearby, the Three Creek Lake Store has limited groceries, ice, snacks, and boat rentals. Firewood is available for a fee. Where to Fly Fish Oregon's Metolius River: There are really three different sections to the Metolius River. The first 11 miles below the springs is a popular Oregon fly fishing area and is the easiest to access. The water is flat through this section and gets a fair amount of fishing pressure. There is no fishing within 100 feet of the Camp Sherman Bridge where large trout cruise looking for bread and other goodies tossed by the tourists. This section can offer some excellent stonefly fishing. This section is known as the Canyon Creek Gorge. The water starts to pick up speed through this section. There is easy access on both sides of the river. There is good fishing here but it also gets a fair amount of pressure so make your presentations concise. Some of the largest trout are downstream of the gorge. The river here is big and the terrain is steep and physically demanding. Access is by hiking the forest service road and undeveloped trails, neither of which is close to the river. Please be careful, wading can be very difficult here. 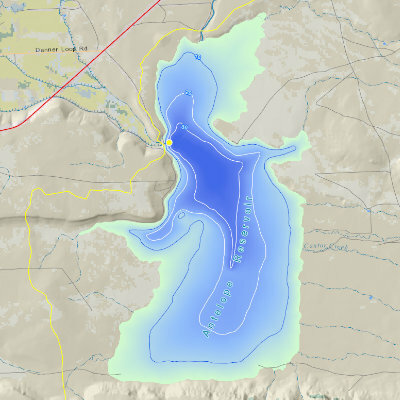 Chickahominy reservoir (From Atlas of Oregon Lakes, Johnson et al. 1985). Chickahominy Reservoir (also known as Clusters Lake) was created during 1951 and 1952 by the construction of a dam on Chickahominy Creek. It was built with private funds to provide storage of irrigation water for the Silver Creek Ranch. However, as of 1970 the reservoir had never filled to capacity and it proved to be inadequate for its intended purpose. It has since been obtained by the Oregon Department of Fish and Wildlife for sport fishing, and has developed into one of the best fisheries in southeastern Oregon. The reservoir had received its first plant of fish in 1957, a load of Kamloops trout, which prospered in spite of competition for food with an abundant population of rough fish. Despite a series of treatments, the rough fish were not eliminated until the reservoir dried up completely in 1968, and no trash fish have been recorded since that time. In recent years stocking has been primarily fingerling rainbow trout, and fish as large as 32 inches have been caught. The reservoir is open all year and winter ice fishing has been good. In 1981 there were 73,175 visitor days, of which 24,880 were for fishing only. Land ownership around the reservoir is almost totally private, with the exception of about 40 acres near the dam which are administered by the Bureau of Land Management; recreational facilities and a boat launch are provided by the B.L.M. The drainage basin is a semi-arid rangeland covered by sagebrush, with sparse stands of junipers at higher elevations. Chickahominy Reservoir is a no use fee to launch facility operated by the BLM. Call 541-573-4400 for additional information. (From Atlas of Oregon Lakes, Johnson et al. 1985). Upper Cow Lake is one of two quite large lakes located in the Jordan Craters area of southeast Oregon. They were formed when the Cow Creek Valley was choked by a number of geologically recent lava flows. The flows issued from the Jordan Craters which are aligned in a north-south direction a little to the west of Cow Creek. One result of this mode of origin is that the lakes extend into lateral valleys behind the lava dam; hence they have very irregular shorelines. During high water stages water overflows across the basalt to supply a number of other lakes in the lava terrain to the southwest. Inflow to the lakes is from a number of intermittent streams and from seepage through the volcanic terrain. There is a 17-foot difference in water surface elevation between the two lakes when they are full, but during summer month's water levels drop considerably. Both are very shallow and are connected by a narrow channel called The Narrows. Upper Cow Lake is a no use fee boat launch managed by: Oregon Department of Fish and Wildlife. Contact: 800-720-6339 for additional information. The Oregon Health Authority has issued warnings about very high levels of methylmercury contamination that makes fish caught from the lake dangerous to eat. The contamination stems from past mining activity along the headwaters of Jordan Creek, near Silver City, Idaho, where large quantities of mercury were used to separate gold and silver from other materials. The boat launch is a no use fee to launch. The Antelope Reservoir is managed by the Bureau of Land Management. Contact: 541-473-3144 for additional information. Or Continue to the Cascade Lakes National Scenic Byway.